Getting the family together. It’s easy as gathering around the table. Family mealtime is when everyone at home sits down and enjoys a meal together. This can be at breakfast, lunch or dinner. Build relationships. 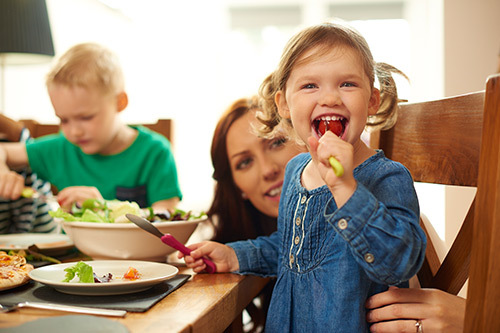 Eating together helps build a close relationship with your children. It gives everyone in the family a chance to learn more about each other. Turn off the TV and don’t answer the phone during mealtime. Instead, use this time to talk, connect and make memories together. It’s a lesson your children will use for life. Eat healthier food. Meals prepared at home are usually better for you than meals eaten while dining out. Learn portion sizes. Teach your kids to take small amounts at first during mealtime. Tell them they can get more if they’re still hungry. Promote stability. Eating with your child helps them think things are OK. It sends a message of family stability. Save money. Eating at home saves the family money. It’s cheaper to cook meals at home than to dine out. Develop cooking skills. Get everyone in on making a meal. Kids love to cook! Letting them help make meals will make them feel valued and part of the family. Practice social skills. Eating together as a family gives your kids a chance to learn and practice their social skills, table manners and conversation skills. Try new foods. Offer your children new foods, but don’t force them to eat them. Let them choose how much to eat. Kids are more likely to enjoy a food when it’s their choice. Making their own food choices also helps them learn to be independent.